From left to right are Minister of Communities, Ronald Bulkan; IDB President Luis Alberto Moreno; IDB Country Representative Sophie Makonnen; GWI Managing Director Dr. Richard Van West-Charles and Sinohydro Project Manager Yang Dechen. The Diamond Water Treatment Plant is 67% complete and is on target to be finished by October of this year, the Guyana Water Inc (GWI) in a release has reported, noting that the President of the Inter-American Development Bank (IDB) has registered satisfaction with the progress of works. 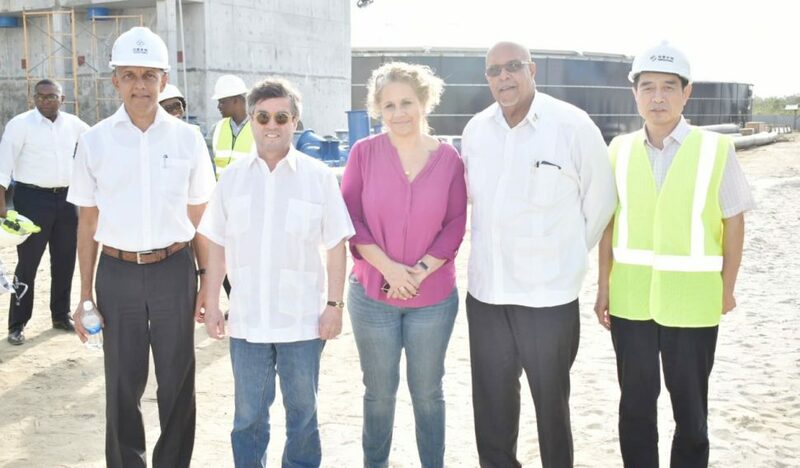 It was related that on Monday, IDB’s President Luis Alberto Moreno, was treated to a tour of the site, which was hosted by GWI., along with consulting firm Hydro Plan, and contracting firm Sino Hydro. Managing Director of GWI, Dr. Richard Van West-Charles said that all four components of the IDB-funded project have been found to be on schedule, based on a series of continuous monitoring activities. 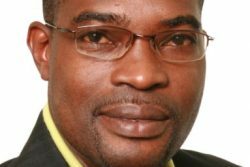 GWI quoted Van West-Charles as saying that the project has been well monitored, having been subjected to the scrutiny of 15 monitoring committees, 20 portfolio meetings and two site visits. According to the release, the 67% completion rate accounts for the conclusion of civil works for major structures such as the sedimentation tank and filters, building works, sludge pond and the ground storage tanks, which are said to be almost complete. 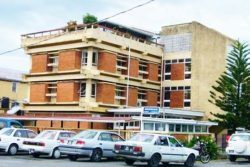 Works outstanding were listed as the installation of all equipment, including aerators, sedimentation tank equipment and filter under-drains, pumps, backwashing equipment and electrical, monitoring and control systems. “GWI believes the completion of the water treatment plants at Diamond, Uitvlugt and Sheet Anchor will augur well for persons in the serving areas, taking into consideration the improved quality of water to be received and reduction in non-revenue water expected,” GWI reported. The release also said that Dr. Van West-Charles highlighted the significant impact of this development at the national level, and noted that this is “the first time in Guyana’s history, metered customers outnumber those who are unmetered, since a requirement of the projects is to ensure customers in the serving areas are metered”. Minister of Communities, Ronald Bulkan, noted that the plant, which will allow an improved level of service and quality of water to be delivered to customers, will benefit 22,000 persons, but has the capacity to cater to 34,000. Once completed, the plant is expected to satisfy the World Health Organisation’s water quality parameters.